To some, personality tests might be an inaccurate, non-factual way of classifying the different people in their lives. 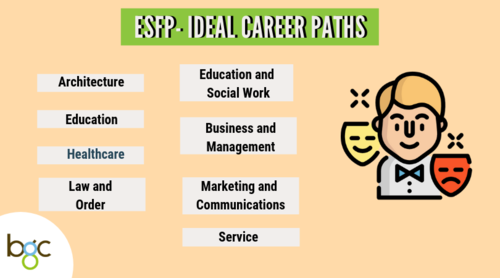 However, the Myers Briggs Personality Types (MBTI) can be a useful tool to help you find both your next career step or your dream career. Don't know what the MBTI test is? Well, Isabel Myers, founder, and creator of the test believed that everyone on earth can be classified according to 16 Personalities. Each of the personalities is made out of one of four psychological functions (i.e. Sensation, Intuition, Feeling, Thinking), which drives each person. Before we get started, it is best to read up more on the Myers Briggs Personality Types and the MBTI Test. This is the first half of out MBTI series, so keep an eye out for our second MBTI article soon! Discovered your type? Let us help you debunk your dream career! People with ENFP personality types are described as enthusiastic, independent, and creative individuals. People with this personality type have excellent social skills and strong empathy skills. Things like routine and mundane tasks and challenges are elements that don’t mesh well with ENFPs. 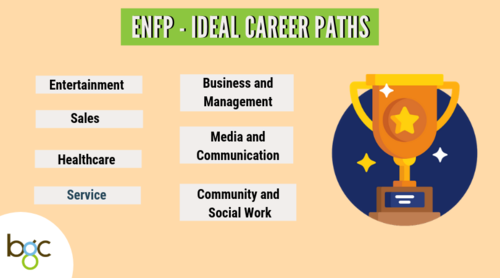 ENFP’s are individuals who receive satisfaction and success when they choose a career that takes advantage of their natural strengths, talents, and communication skills. 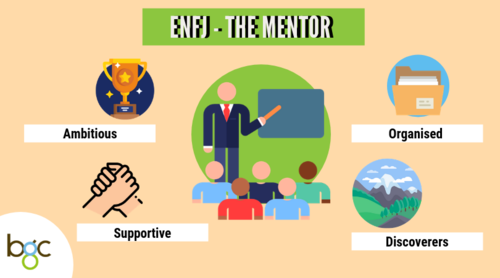 ENFJs are energetic, driven, and idealist organizers, also known as the “mentor” personality. People with this personality type want to encourage others to discover and pursue the greater developments of their strengths. 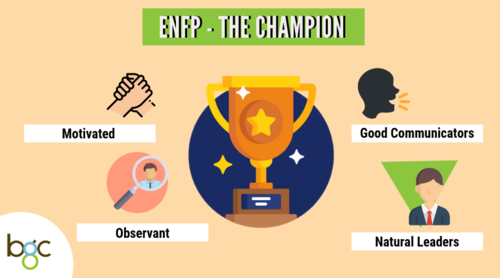 ENFJs are good communicators and enjoy helping others solve their personal problems. 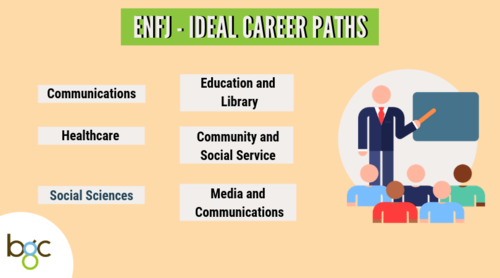 Individuals with this personality type seek out careers that are people centered with the potential for them to exercise some form of leadership. 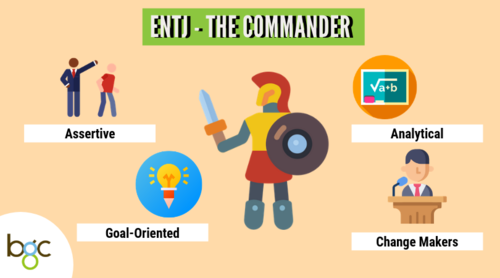 ENTJs are natural born leaders. They are articulate and prefer logical reasoning as it allows them to tap into the analytical part of their brain. Just like a military commander, individuals with this personality type are blunt and direct in their speech, preferring to be assertive. 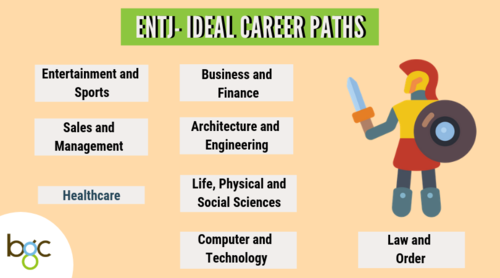 Success and hard work motivate ENTJs. Commanders flourish in an environment that allows them to be goal-oriented and help lead change. Individuals with this personality type thrive in managerial and supervisory roles. They want structure in their work - which is why they thrive in workplaces driven by business and numbers. Like the ENTJ, ESFJs value order. 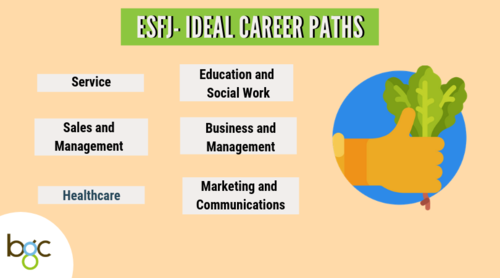 However, the ESFJ is a sensitive personality, and are often perceptive of their surroundings. Individuals with the provider personality like to get involved and help out others. 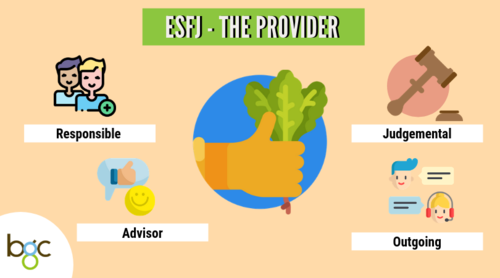 However, the ESFJ does have some prominent weaknesses such as seeing things only in black and white, as these individuals stick to a strict moral code. Those who stray away from this moral code will be met with judgment and brutal advice - but remember this is just the ESFJ’s method to promote harmony and make everyone get along. Providers are the second more common personality type in the population. Individuals with this personality type have success in working with others. An ideal workplace environment would be one with a structured environment and clear expectations. 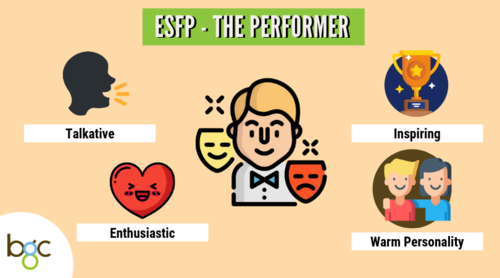 To the ESFP, all the world’s a stage, and all ESFPs are merely players. Spontaneous, entertaining, and energetic, the Performer can be identified as a talkative person with a warm and inspiring enthusiasm for life. Performers are a group of people who enjoy going with the flow. They do not enjoy strict rules and excessive official procedures, choosing a workplace/career that allows them to assist people with problems and/or demands of the present world. As an agency in Singapore, BGC Group is made up of many different MBTI types working together towards our goal – recruiting you to your next job. Whats your MBTI type? Let us know in the comments section below!